My cell number is 613 850 6529 if you need to send a text the morning of. Please specify full name and division if registering by text. Any additional fees if I'm not a member of the Quebec Tour/Club/Association? Nope. Every QDGT event costs the same. This website, http://www.quebecdiscgolf.com/ , explains it all. How the formats and fees are divvied up are in the links. It's quite well thought out. 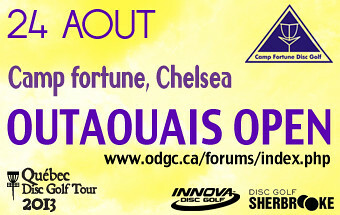 I won't be able to attend but I took the liberty of posting the flyer on front page of the ADGM website and change the countdown for next tournament to outaouais open. I will make something facebooky tonight. Love the countdown! Thanks, Ben! This should be advertised in the ADGM forums. I started one. 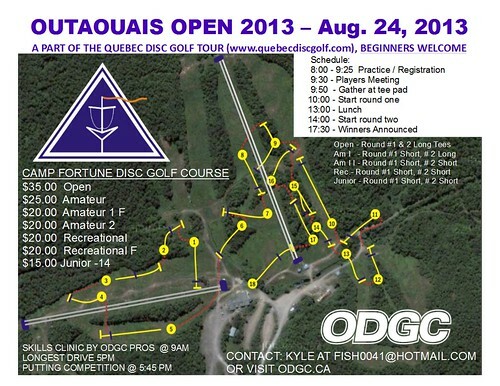 The disc golfers of Quebec deserve to play CF.